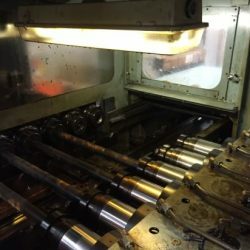 A gundrill is a type of deep hole drill that specializes in cutting the required tolerances of hole roundness, straightness, size, finish, and concentricity in one pass. Though it can cut any size hole, the gundrill is especially desirable for very deep hole drilling, able to machine parts at up to a 300:1 depth-to-diameter ratio. The gundrill was invented over 100 years ago to machine gun barrels. The basic innovation of forcing chips outward down a long fluted drill soon lent itself to many more operations than this, however. A gundrill produces consistent hole quality of whatever depth with a high degree of consistency, repeatability, and accuracy, while requiring minimal supervision. 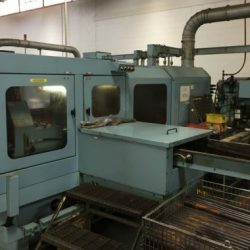 A gundrilled piece does not require any secondary operations after its initial pass. Reaming, honing, deburring, and their associated time and energy costs are unnecessary. 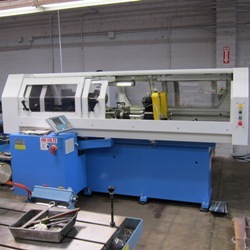 Constant flow of pressurized coolant not only flushes any chips directly into a chip box, resulting in a clear work area, but also cools the drilling area and increases tooling life. 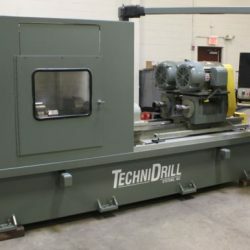 Overall, a gundrill provides: lower fixturing costs; increased productivity; quick, simple conversion from job to job; the ability to handle both production and job shop quantities; the ability to multiple load like parts; and the capability of regrinding drill heads much greater than standard twist drills. 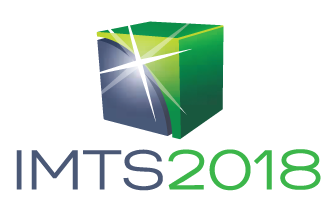 For answers to your questions or more information on gundrills call Liberty at 847-276-2761 or send us an email at sales@libertymachinery.com. 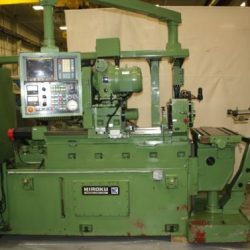 Liberty Machinery buys and sells more gundrills than any other used machinery dealer. We are your #1 source for a high quality gundrill. There is a small hollow running down the entire length of the gundrill, as well as a fluted notch running along the side. 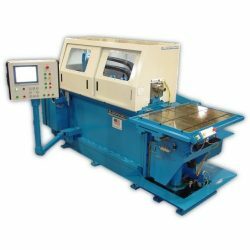 As the drill rotates and cuts the metal, the coolant system pushes high-pressure coolant down the hollow pathway, forcing the chips back outward along the fluting and directly into the chip box. 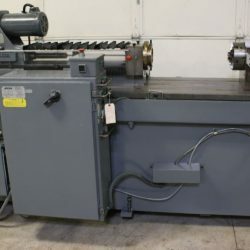 The machine that controls this process may be either conventional, N/C, or CNC, and may feature multiple spindles or spindles with counter-rotation to the gundrill itself. Part handling may involve an optional knee-bed system to aid in quick changeover. Virtually any industry requiring the production of close tolerance holes may utilize a gundrill. Liberty is always looking for used gundrills to buy for inventory. Contact us and let us know what you have for sale. We’ll be happy to give you a free quote. See our used Gundrills for sale. 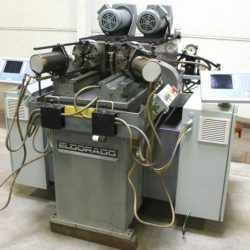 Eldorado Gundrilling Machines & Systems, Gundrills, Gunbore Tools, Sharpening, Fixtures. Eldorado (Milford, CT: PCC Specialty Products, inc., 1996). The Mega K75 3 axis System. Eldorado Tool & Manufacturing Corp. (Milford, CT: n.d.). Gundrilling Systems. Eldorado Miroku (Tokyo: Miroku Kikai, n.d.). 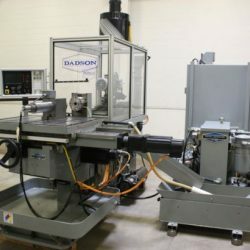 On the Mark: Introducing the Dadson Deep Hole Drilling Center. Dadson Corp. (Grafton, WI: Dadson Corp., n.d.).